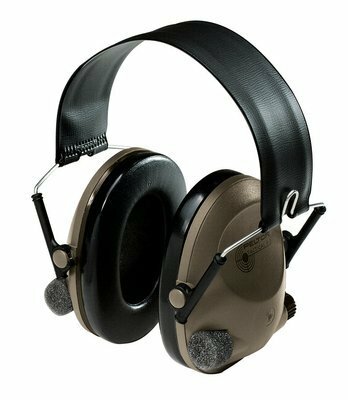 This compact tactical earmuff headset attenuates Noise, amplifies weak sounds while helping to provide reliable tactical hearing protection. Folds easily into a small package . Great for hunters and shooters. This lightweight, tactical electronic earmuff features level-dependent technology that blocks out potentially harmful noise when needed while still allowing you to listen normally when not. So you can more effectively listen and communicate with your surroundings, hunting team or range officer. Designed by 3M PELTOR for rugged hunting and shooting environments, the SoundTrap Headset combines professional-grade durability with lightweight comfort for all-day wearability. The Soundtrap tactical headset easily folds into a small package for carrying in a pocket or bag during transportation. Dual volume controls allow the wearer to set sound settings to a customized level. Great for hunters, shooters and those with hearing loss. Folds into compact size for pocket storage. 1.5 V long life AAA batteries provide 200+ hours of service.